A once-in-a-lifetime experience listening to a very unique instrument. In a previous post I wrote about a performance of the St Saens ‘Symphony with Organ’ at the Albert Hall. 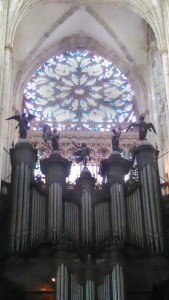 In researching that instrument, I learned about the organ at the Abattiale de St Oue, in Rouen, which is held by many to be one of the greatest ever built. 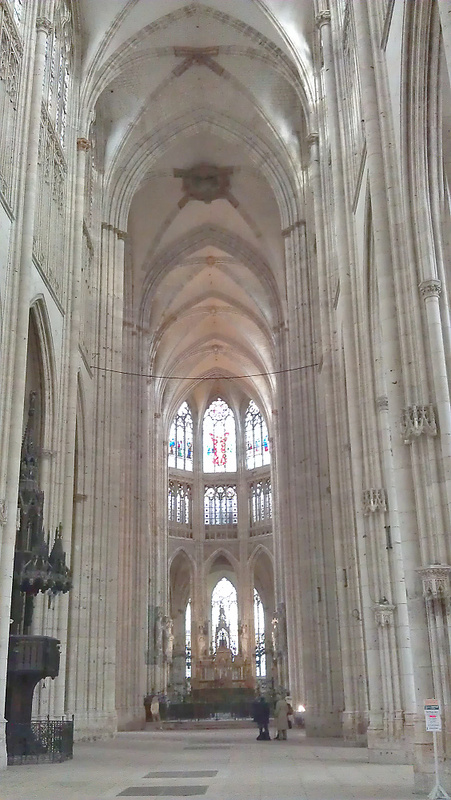 Since we drive through Rouen every trip to La Rocheliere, I timed our most recent trip to coincide with a performance of Widor’s 5th symphony – which we saw last Sunday. And it was a truly awesome experience. 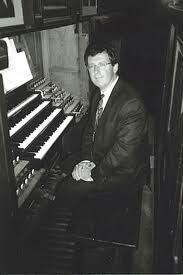 The St Ouen organ was built by Aristide Cavaillé-Coll, in 1888, over what was already one of the largest instruments in France. It is notable for it’s sonorous and huge 32 ft contre bombarde reed which is capable of a shattering but tuneful sustained note (which is described very colourfully in this lovely forum comment), but all of it’s stops combine to create a beautiful sound. This can only really be experienced in situ, as the bass notes alone are impossible to reproduce on any hi-fi, and the accoustics of the Abbatiate take the sound to a different level in any case. So it was with a rare sense of anticipation that we paid our 10 euros, and settled ourselves into some remarkably uncomfortable chairs for a concert by Gerard Brooks last Sunday afternoon. Listening to any organ solo is a bit strange, but at Saint Ouen it moves into the edges of the surreal. The organ itself of course does not move in any way – or indeed visibly show any signs of the extraordinary sounds it is emitting. 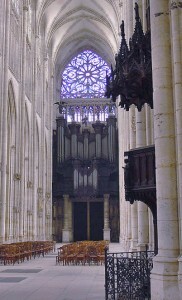 In addition at Saint Ouen, the organist is completely hidden from view. This is is in marked contrast with an orchestra or chamber group in which animation is part of the performance. Here is there is no visual indication of any activity at all. If you were deaf, you might be completely unaware of a performance taking place. You are however, more or less impelled to look at the organ, since it looms in front of you. But it is at least 30 feet up in the air, and above it is an enormous and celestial stained glass window, framed by winged figures on top of the reed pediments. So the audience sits with their heads canted at 30 degrees, staring up at a completely inanimate object. 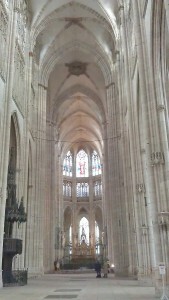 One member actually sat facing the other way, looking at the admittedly magnificent nave and sanctuary. You can hear a clip that demonstrates this sound here. Of course what we had come to hear was the famous Widor 5th symphony. You may think you have never heard this, but the toccata at the end is instantly recognizable – here’s an amazing clip of Widor himself playing it in the 1930s. 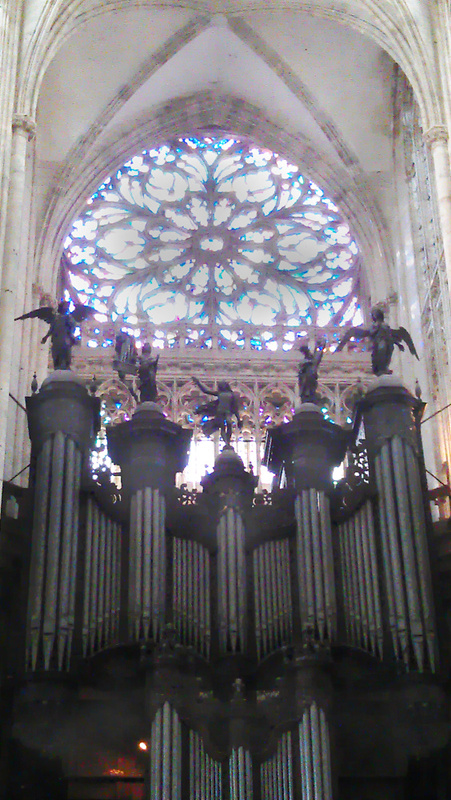 I can’t find a clip of the Saint Ouen organ with this piece, but suffice to say, it was an incredible experience. The earlier movements which I had only occasionally heard were actually quite beautiful, but the toccata itself, with it’s thrilling clarions at the start, and an absolutely monumental thundering conclusion was a marvelous experience. This was of course originally an ecclesiastical instrument – designed to induce shock and awe into parishioners and monks alike. And no question, it still does that. I have to say, at times though the sound was almost diabolical – you had visions of a Rasputin-like organist in black robes and long hair manically flinging his arms around in a devilish display of frightful power and sinister depths. The reality of course is more prosaic – here is a clip of the actual console being played at Saint Ouen – pretty complicated, and apparently needed three people to keep the whole thing moving.